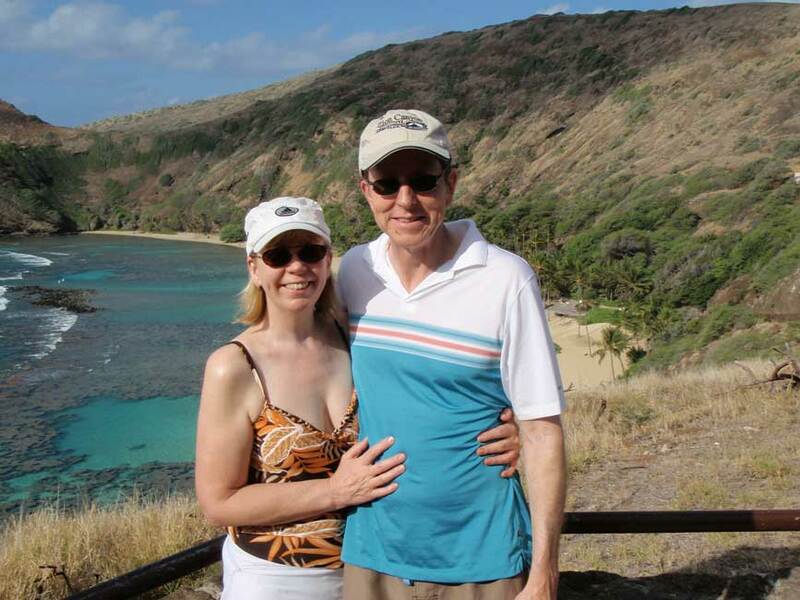 It’s easy to get to Hanauma Bay Nature Preserve. Hanauma Bay is about 10 miles from Waikiki. I’ve been three times now, in 2008, 2009 and 2013. I’ve used a tour, a rental car and the local bus to get to Hanauma Bay. The least expensive way to get to Hanauma Bay is by city bus #22, but it takes more than an hour. The #22 city bus runs every hour in the morning and every half hour in the afternoon. Make sure you pick the right day, because Hanauma Bay is always closed on Tuesdays. A shuttle service can be arranged from many Waikiki hotels. Try Hanauma Bay Tours, Hanauma Bay Snorkel Adventures, Tommy Tours or Viator, for reasonable return transportation including snorkel equipment. Using a rental car can be problematic, since the parking lot is small. When the lot is full there is nowhere nearby to park. Hanauma Bay Nature Preserve charges a small entrance fee and requires you to watch a video about protecting the reserve before you can snorkel. The hill down from the entrance gate to the beach is very steep. You can pay a few dollars to ride the tiny shuttle. The walk down isn’t tough, but at the end of the day, when you have no energy left, you will likely be grateful to pay for a ride up. Snorkel gear can be rented at the beach and there are storage lockers for rent too. The beach is lovely and the palm trees provide an option for shade. 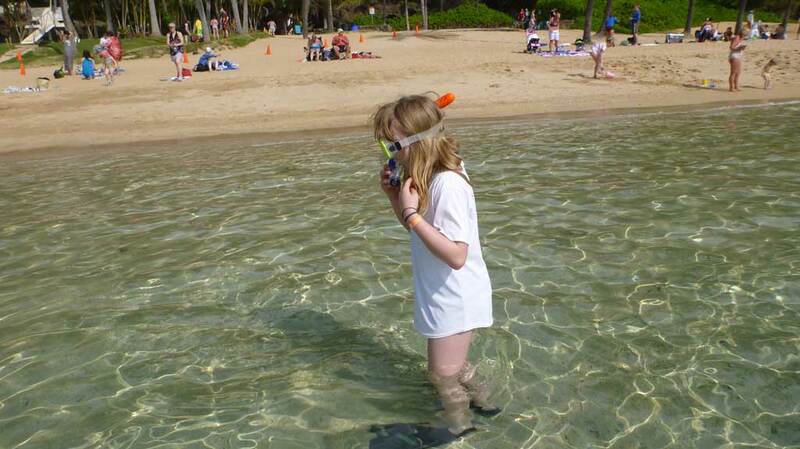 A Hanauma Bay Snorkel is a great introduction for beginner’s to learn. The wind usually drives on shore and the reef creates a protected area for swimmers and snorkelers. So, it’s a very safe location. Tropical fish were easier to see in 2008. Unfortunately locals told me that many years ago the reef was full of fish, but now every year has less fish and more tourists. As soon as you swim to the edge of the coral reef, tropical fish start to appear. Try not to step on the coral, because it damages the reef and can also cut you badly. I saw lots of convict tangs, but you can also see wrasses, angelfish and other tangs. The first fish my young granddaughter saw on our 2013 snorkel was the famous Huma Huma Nuka Nuka Apua reef triggerfish. She was very excited. 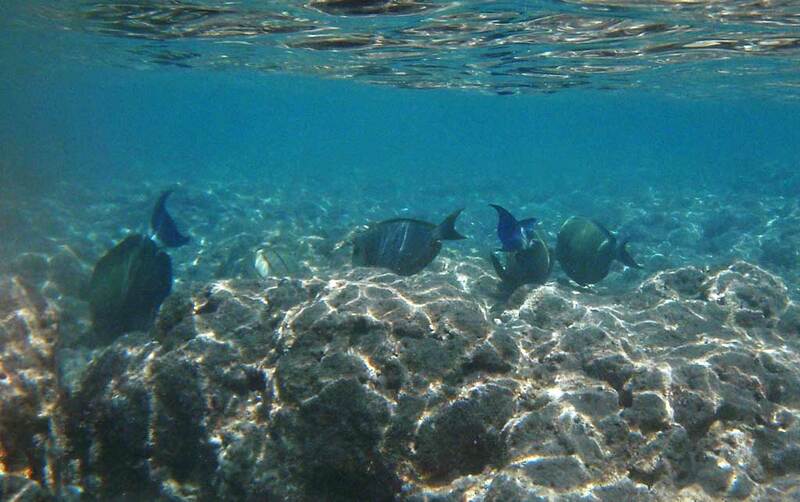 On one snorkel, two large disc shaped fish were suddenly right beside me. You could see their eyes studying me with an ominous glare, but they soon sped off. I’ve never figured out what they were, but it’s the only time I’ve been unnerved snorkeling. And that includes snorkeling with black tipped reef sharks in Moorea. There are a couple channels through the coral reef that experienced snorkelers can use to reach deeper water. When you do that, you have the chance to see turtles and larger schools of tropical fish. You have to be prepared for a battle with the current though. If you are there for a beginner’s snorkel, stay inside the reef. 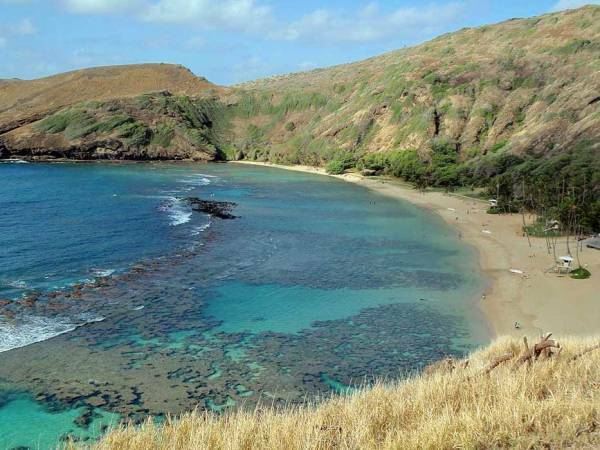 A Hanauma Bay snorkel is a great introduction that might lead you on a quest to find your own favorite location in one of the many reefs of the Hawaiian Islands.